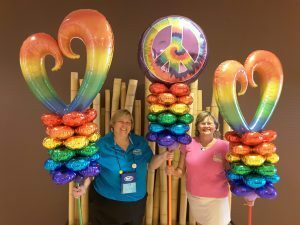 You get 40 balloon professionals from around the U.S. to gather together to work! 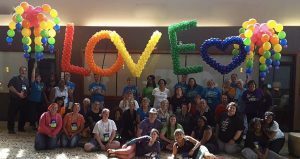 This week, I’m in Chicago working as part of a 40-person team to create Chicago’s largest, joyful, and most fun-filled balloon entry for this week’s Chicago Pride Parade, which happens to be their largest annual parade. The parade will step off at noon on Sunday, June 26, to entertain over one million spectators. The team that Prepared for Chicago Parade. 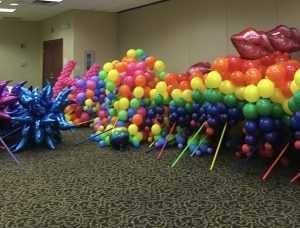 Our team is incorporating over 40,000 brightly colored balloons to create an impressive parade entry that will span over a 3-city block area! The theme of the design is “Peace, Love, and Happiness.” We’ve been working several hours a day to build each element of the display; and it has been great fun creating this exciting interactive float! The work will continue Saturday so we can complete all details before Sunday’s parade. The float’s designer,Tommy DeLorenzo, has made sure each part of the entry is moveable, colorful, and loads of fun. I’ve loved learning tips and tricks this week that further improve my skills so I can bring even better designs to you! I’m sure this parade is going to bring smiles to many, many people on Sunday. As the parade steps off, I’ll be flying back to Knoxville, but hope to get some videos so I can share them with you. For now, here is a sneak peak of what Chicago citizens will get to see on Sunday. I’m hoping that Above the Rest will participate in upcoming parades in the Knoxville area and use many of the skills I’ve learned this week to delight our Knoxville residents! energy of interacting with like-minded professionals. Great workshop! Can’t wait to share what I’ve learned with Knoxville! I’m ready to strut our stuff in a parade! Who wants to join me?